First published in 1983, this book attempts to unify two bodies of theory which had become severely disjointed. Theories of the planning process had become detached from those of the urban and regional processes which are the subject of planning intervention. 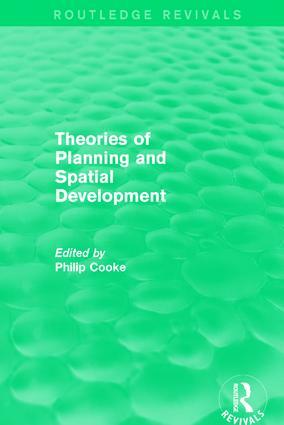 The author argues that major weaknesses of planning intervention in cities and regions have resulted from this split, and shows how it is possible to develop an integrated theory of the relationship between planning and spatial development. The mechanism which helps to unify the two fields is the division of labour. This poses problems for the planning system as its spatial requirements change but it depends upon the state planning framework in order to overcome those obstacles — hindering its capacity for spatial reorganisation. This book offers a thorough analysis of these obstacles and requirements by references to contemporaneous theoretical advances in the study of the development process, the state (especially at sub-national level), and the labour market. It is argued that the way capital makes use of urban and regional space can be explained by using the theoretical framework which is developed and, on this basis, point to certain innovative ways in which the processes underlying urban and regional de-industrialisation may be countered.